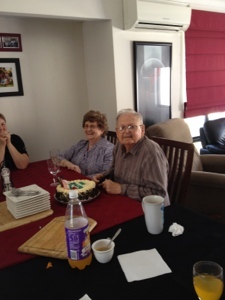 Decided very quickly that I needed to go and see my Daddy for his 86th birthday. You never know if he will be around for his next one, so got up early (for me) and hit the road at 9am for Perth. He was pleased that I went up and it was a lovely day enjoyed by my brother, sister-in-law, sister and a few other relatives and also my second son and his wife and baby. Thank you for my lovely sister again for her hospitality on all fronts. I also got to go out to dinner with my fourth son which I enjoyed very much. I always go up to Perth over night as even though it is not too far I find I get too tired to go up and back in one day. 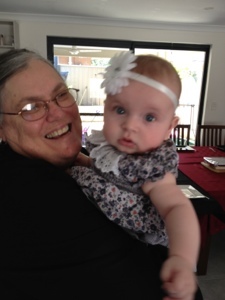 On the way back I stopped in at Safety Bay to have even more cuddles with my gorgeous grand daughter. You had a wonderful day, Janine. And the pics are nice.